Watched this fantastic movie last night and rewatched again twice today. This film is utterly charming. The film stars Helen Mirren, the owner of a Michelin-starred restaurant in France. A family from Mumbai buys the property across the street and opens up an Indian food restaurant. The younger son, a food/cooking prodigy since a young age learns the fine art of French cuisine in the process of becoming a famous chef primarily by infusing his Indian roots into French classical cooking. Two romances, wonderful food, spectacular setting make this one of my favorite films ever. Also, the male lead, Manish Dayal (Hassan) is utterly gorgeous. 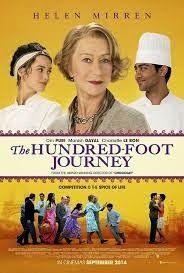 And Dame Mirren is ever the perfect actor especially paired with Om Puri, who plays the father of Hassan. Don't miss this. It's out in DVD and cable. Produced by Oprah and Steven Spielberg, the results are a magical wonderful film. Direction Lasse Hallstrom.